So, this is disgusting. A dating coach is spamming all of Eliot Rodger's videos with an important message: This could have all been avoided if Rodger had used his services. Because that's the issue here, that Rodger didn't know how to pick up women. How low do you have to be to use this kind of tragedy as an advertisement for your business? How insulting to assume that all of this could have been avoided with some artfully taught lessons on how to "neg." What happened last night was a complex mix of mental heath, misogyny, and entitlement. 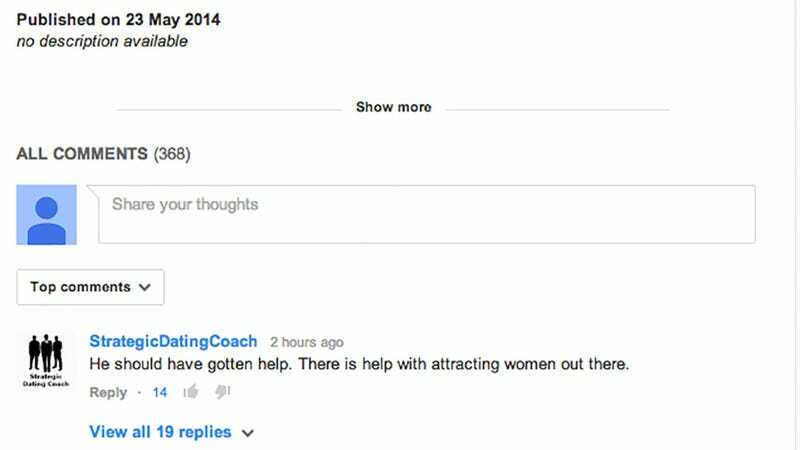 Suggesting that a dating coach could have solved Rodger's problem isn't just stupid but disrespectful to the victims. Yes, Rodger should have gotten help. But the help he likely needed would have been provided by a licensed clinician, not some guy who believes that the murder was an inevitable reaction to not having any game. Women, objects you can obtain instead of murdering! Let's hope he goes out of business immediately.